Escalating his administration's response to the disastrous Gulf oil spill, President Barack Obama announced Thursday a moratorium on new deepwater oil drilling permits will be continued for six months while a presidential commission investigates, a White House aide said. Controversial lease sales off the coast of Alaska will be delayed pending the results of the commission's investigation, and lease sales planned in the Western Gulf and off the coast of Virginia are canceled, the President announced at a news conference. Shell Oil was poised to begin exploratory drilling this summer on Arctic leases as far as 140 miles offshore. Those steps, along with new oversight and safety standards are the results of a 30-day safety review of offshore drilling conducted by Interior Secretary Ken Salazar at Mr. Obama's direction. With the moves, Mr. Obama is exerting control over the response to the five-week-old spill amid growing criticism about leadership from the White House even as BP's efforts to stop the leak are finally showing promise after a series of failures. Can BP Be Trusted in Light of Past Violations? The president's announcements also could be an early sign of a fundamental shift in the administration's policies on offshore drilling, which Mr. Obama promoted and hoped to expand prior to the April 20 explosion of a drilling rig off the Gulf Coast. The accident killed 11 people and unleashed a gusher of crude that's now begun to wash up on land and cripple seabirds. The exact causes of the accident are not determined but congressional investigators have released details suggesting BP ignored warning signs of instability in the exploratory well they were attempting to cap when the explosion occurred. Mr. Obama, who on Saturday appointed a presidential commission to conduct a wide-ranging, six-month investigation of the causes of the spill, will travel to the Gulf Coast on Friday, his second visit since the accident. Thursday's announcement and news conference in the East Room represents the first time he's opening himself to extensive media questioning since the accident occurred. For all his power to make such rules, however, the president admitted Thursday he must depend mainly on the company that was leasing the Deepwater Horizon drilling rig when the explosion occurred. 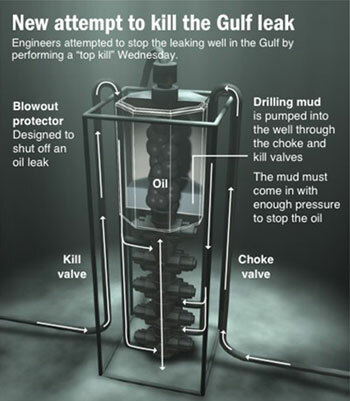 BP PLC began a new effort Wednesday to plug the mile-deep well with heavy drilling mud, a tactic never before tried at such depths. The company hoped to know by Thursday afternoon whether the tactic would finally slow the oil; as of Wednesday night executives reported no problems so far. oversight, regulation and what went wrong. Americans polled by CBS News expressed frustration with both the global oil giant and President Obama for their handling of the environmental disaster. Only 18 percent of those polled said they approved of how BP was acting in response. An overwhelming majority -- 70 percent -- said they disapproved. 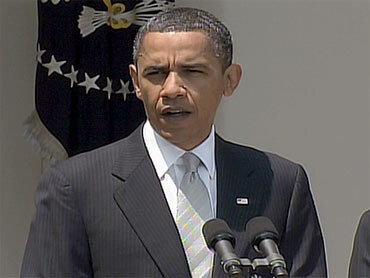 President Obama fared slightly better, with 45 percent saying they disapproved of his handling of the crisis. That still represents an overall negative rating, however, as only 35 percent said they approved of his words and deeds since the disaster struck. At the Capitol on Thursday, lawmakers were grilling various officials at five congressional hearings. Topics included the Gulf spill's environmental damage, the administration's response and the impact on small businesses. On Wednesday, Salazar told the House Natural Resources Committee that lax oversight of oil companies dates to the administration of Republican President George W. Bush. "Essentially whatever it is they wanted is what they got," Salazar said. GOP Rep. Doug Lamborn of Colorado asked when Obama's team would stop blaming problems on an administration that left office 16 months ago. Salazar replied that the federal Minerals Management Service, while heavily criticized lately, is still not "the candy store of the industry, which you and others were a part of."